14 Bedroom house in Corolla - OCEANFRONT 14 BEDROOM MANSION "SUMMER WEEKS ON SALE NOW" Early Bookings Only! OCEANFRONT 14 BEDROOM MANSION "SUMMER WEEKS ON SALE NOW" Early Bookings Only! 1 / 66 Total New Remodel for 2018 for an Already Great Home! SALE PRICES For Spring & Fall Save RIGHT NOW! This House Rents SUNDAY to SUNDAY. Please Go To The Last Page Under "EXTERNAL LINKS" To See Our New Video. The Fitzgerald & Hemingway are one of the most popular Vacation Homes in the Four Wheel Drive Area of Corolla. Truly Get Away From It All At "The Fitzgerald". Also check out on F a c e b o o k, type in "Carova Beach", Friend Us! SO MANY NEW FEATURES THIS YEAR! ***MORE NEW Leather Furniture Throughout House! ***HUGE ALL NEW GOURMET VIKING COMMERCIAL TYPE KITCHEN! ***NEW ADDED BEDROOM. NOW A "14" BEDROOM HOME! ***ALL NEW ADDED POOL CABANA WITH FRIDGE & SINK! ***WHOLE HOUSE Reverse Osmosis Water Filtration! This House Rents SUNDAY to SUNDAY. Please Go To The Last Page Under "EXTERNAL LINKS" To See Our New Video. 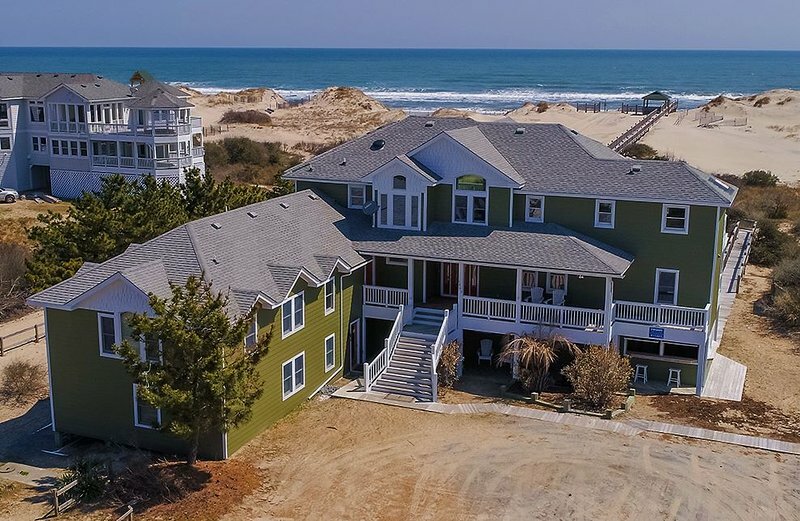 THE FITZGERALD is one of the most popular Vacation Homes in the Four Wheel Drive Area of Corolla. Truly Get Away From It All At "THE FITZGERALD". This beautiful 14 Bedroom Ocean Front Home that sits atop 3 1/2 Glorious of Sand & Dune Overlooking the Atlantic Ocean! Great for WEDDINGS, FAMILY REUNIONS and other LARGE GATHERINGS. You will need a "Four-Wheel-Drive" Vehicle to get to this exclusive property. This home is named after one of the country's most respected Authors, F.Scott Fitzgerald. The Fitzgerald is appointed in the grand-manor style similar to that of the era in which this great author lived. Spacious common areas and luxurious amenities, offer comfort and entertainment for your large group to make and share beach vacation memories. You can explore the expansive northern beaches and delight, with views of both the Atlantic Ocean and Currituck Sound from the abundant decking on all levels of this magnificent home. Also check out on F a c e b o o k, type in "Carova Beach", Friend Us! Some of the Amenities Include: Large Heated Ocean Front Pool, Private Walkway to the Beach, Private Ocean Front Gazebo, Ocean to Sound Views, Elevator, Theater Room, Competition Pool Table, Large Wet Bar, Mid Level Family Room, Third Floor Family Room, Stone Gas Fireplace, Open Kitchen with seating for 27, Large Decks Facing South, East & West. Beautiful hardwood floors in all the common areas, Bathrooms have Ceramic Tile Floors and Granite Vanity Tops. BEDROOMS: LEVEL ONE - Five Bedrooms = Five King Size Beds. BEDROOMS: LEVEL TWO - Five Bedrooms = Five King Size Beds. BEDROOMS: LEVEL TWO - One Bedroom = Queen Size Bed. BEDROOMS: LEVEL TWO - One Bedroom = Duo Bunk (Sleeps Three). BEDROOMS: LEVEL THREE - One Large Master Bedroom = King. PETS: Dogs are welcome (Up to 2). Dogs are permitted at an additional cost. ($125 Per Dog). HEATED POOL: Pool may be heated upon request for an additional weekly fee of $375(plus tax). Must be requested in advance in order to allow enough advance time for water to reach specific temperature. Available (May 2nd - October 17th). SPECIAL EVENTS: Weddings are welcome for an additional cost of $1,400. Please make arrangements in advance as additional cleaning and trash removal are required. A charge of $1,750 will be charged if these arrangements aren't made in advance. THIS HOUSE IS DECORATED FOR THANKSGIVING AND CHRISTMAS! In your four wheel drive vehicle, it will only take a few minutes to get from your house to the town of Corolla. Here you'll find a Triplex Theatre, Food Stores, Fresh Vegetable Stands, Sandwich & Coffee Shops, Put-Put Golf, Bumper Cars and a Go-Cart Track. Best of all though, you'll find some of the best Restaurants anywhere. There are golf courses near by. You can climb the famous Corolla Lighthouse or visit the Whalehead Club. While you're there you might take in the Corolla Museum to catch up on the local history of the area. There are so many things to do, yet you are only minutes away from the privacy and seclusion of your Beach House. No Loud cars or trucks, no Police Sirens and none of the pressures of everyday life. All that stops here. Once your tires hit the sand, you'll know you've finally escaped to a place where everything changes. The stress you arrived with melts away the minute you see and smell the Beautiful Atlantic Ocean. On the way to the house you'll see Wild Horses roaming the beaches and your own yard. At night you see the Fox and Deer walking through the landscape. Enjoy the Moon the Stars and Smell of the Fresh Salt Air. The Stars are so bright without the ambient lights of the city. A few hundred feet away from your house you can climb one of the largest sand dunes in all of Outer Banks. When you reach the top, you can see for miles and miles. Ocean to Sound, North to South. You can even see the famous Corolla Light House. There are few places in the country where you can enjoy a Ocean Front House in such a private setting, yet still be only minutes away from the amenities of a small town. This is truly the Best of Both Worlds! Make Sure You Understand You WILL NEED A FOUR WHEEL DRIVE VEHICLE In Order To Get To This Home! We Rent Four Wheel Drive Vehicles to our Guests, Very Reasonable! Low Rate for 4x4 Rental. 1st Come 1st Serve Basis so Book Now! I was so impressed with every aspect of not only the stay itself, but all of the planning and support from the property's owner and its caretaker. My extended family - 21 of us in all - had such an amazing stay at this property. The house itself was perfect for our needs - it gave everyone some privacy with plenty of bed rooms, an amazing large kitchen with seating for our entire group and commanding views of the ocean, and beach access that was simply a dream come true. It was safe, clean, and very well thought out. This was the first time we had visited the outer banks, and the 4x4 beach area as an excellent way to get the most of our visit. Having the choice of beach or pool, the comfort of the house on the ocean, and the privacy of a limited access environment provided all that was needed for a fantastic trip. 4x4 driving was totally fine, and it was easy enough to get into town - however we really enjoyed just staying close to the house and enjoying the privacy. We saw the horses multiple times, they even came up to the fence surrounding the pool on the property and in the driveway. Each morning, a good number of us enjoyed the sunrise from the beach. Shane, the caretaker, was very responsive and just a wealth of knowledge about the house and the area - he really helped to get us acclimated and confident with the property. I would not hesitate to rent the property again for a future trip. I miss our time there already, and it has only been a few weeks since we left! Loved the house, every room had a bathroom and all the guests had space. Very comfy. We didn't get wifi for 4-5 days, so that was stinky. Everything else was great though. We arrived at the Fitzgerald on Sunday, August 30th, and departed very sad on Sunday, September 6th. This was a group of 13 friends, and the 1st time that we had taken a trip for this long and this distance together. Vacation site was amazing - beach was wonderful and even on the couple of rainy days that we had, we still enjoyed the pool and hot tub and it didn't dampen our spirits. Was great to watch weddings that happened next door on the beach and have the horses come right up to the house. Could have used more refrigeration as we cooked for most of our meals and space was limited, but now we have learned to be better organized for our next adventure together. This 13 bedroom oasis was a fabulous, inviting and clean place to spend a week. Waking up to sunrises that lit up the sky is something I will never forget. The Fitzgerald was clean and bright. The wild horses paid us a visit which was spectacular. Owner's reply: thank you so much for sharing your experience at the Fitzgerald, you were a wonderful group and we certainly hope you will come back very soon!